Marriott International will break a 20-year development drought in Australia by opening a new-build hotel in Docklands, following the Victorian Government’s approval of Capital Alliance’s mixed-use scheme. Approval for the tower had been capped at 60 metres – much lower than the 109 metres originally submitted. The $200 million project will become Australia's first new Marriott hotel in 20 years. According to the developer the hotel has already attracted strong interest due to its proximity to the District Docklands, which is currently undergoing a $150 million upgrade. “This project will be a true destination in Melbourne and something special that will add to the city’s tourism potential.” Capital Alliance managing director Mohan Du said. Marriott International Regional Vice President James Doolan, said the hotel will be a flagship in Australia. “We are excited to bring our flagship Marriott Hotels & Resorts brand to Docklands as part of this visionary, mixed-use project. The hotel will be [...] a true example of the Marriott brand’s sophisticated style and innovative functionality. "The new Marriott hotel and apartment project will be Capital Alliance’s second mixed-use development in Docklands, with the five star M Docklands project completed in February 2016. 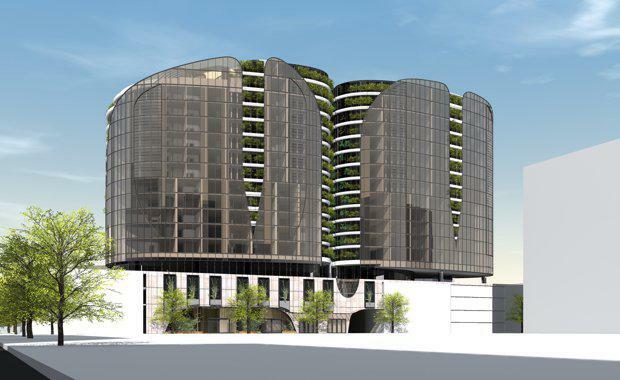 The project includes 186 apartments and 87 hotel rooms at Docklands’ first five star hotel, Peppers.